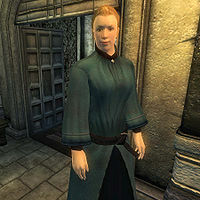 Agata, a Nord mage, is an Evoker of the Mages Guild who sells spells and offers recharging services at the Leyawiin Guild Hall. She has lately taken up the de facto leadership of the chapter after the former head has been having some problems. During the recommendation quest, you will be directed to her to find out more about Dagail's visions. She lives a relaxed lifestyle devoid of responsibility. She sleeps in a bed in the second floor West Wing from 2am until 9am and will then spend most of her day wandering around the guild building. At midday and at 6pm she will break off for a two-hour lunch and dinner in the ground floor dining room. She wears the standard mage's robe and a pair of thick cowhide shoes. Her only other possession is a leveled amount of gold. She doesn't wield any weapons, relying instead on a set of medium-higher level Mysticism spells. These are also the same spells that you can buy off her cheaply, since her Mercantile is a mere 6. She will offer her services when not eating or sleeping. The first time you meet her, she will introduce herself by saying: "My name is Agata. I'm responsible for enchanted item recharge for the Guild here in Leyawiin." If you are not yet a member of the Mages Guild, she will strongly recommend you become one: "There's no place like it in Cyrodiil; it's truly one-of-a-kind. You should think about joining. Dagail can make you a member, if you like." When asked about her home town, she will fill you in on her "other" function in the guild hall: "I take care of what little administrative work there is. Dagail isn't interested. I do it because it has to be done, and no one else wants to do it." She will also provide you with a tip: "You may need to ask around, but training in all the schools of magic can be found at our various guild halls." On the subject of Dagail, she sorrowfully states that "She's led such a troubled life. I just do what I can to make it easier on her." Her fellow guild members are grateful for her work and will comment about it frequently. S'drassa will tell you: "She's been a great help to all of us in the guild. Without her, I think Dagail would be lost at times." Alves Uvenim shares a similar opinion: "Agata is the first person I go to when I need something. Maybe I should talk to Dagail instead, but I just don't feel comfortable doing that." Even Dagail will be thankful: "She may be young, but her heart is old and wise. It guides her well through these troubled times." Kalthar will also express his gratitude, although with a point of poignancy: "She's the one you want to talk to if you actually need something to get done around here. I don't even know why Dagail is still around." This page was last modified on 25 March 2018, at 02:38.